Ulysse Nardin presented this limited edition of 75 pieces in honor of Rolf Schnyder, the owner of Ulysse Nardin for his 75th birthday. It is the iconic breathtaking and Mesmerizing “FREAK”. 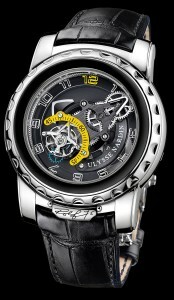 It is a 45mm platinum case, double tourbillion Carrousel, with a 7 day power reserve, manual wind movement. The exhibition glass back reveals the IMPRESSIVE Ulysse Nardin 7 day power reserve main spring. Available on elegant crocodile leather strap with platinum folding buckle.